1 September 2008, at 12:06p.m. 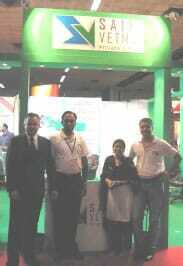 The official launch of Orego-Stim® successfully took place at the Ildex Show, India 22-24th August 2008. Saife Vet Med (www.saifevetmed.com) became Meriden Animal Health’s (www.meriden-ah.com) distributor for India earlier this year. They have been working hard with the support of William Stewart – Regional Manager, in preparation of the launch of Orego-Stim® (www.orego-stim.com) into the Indian market. The official launch of Orego-Stim® successfully took place at the Ildex Show, India 22-24th August 2008, with over 50 vets from the industry passing through the stand to see the Saife Vet Med team. “We had the busiest stand at the show and are very happy that the top integrators in India have already agreed to use Orego-Stim®” said Dr Ali Asgar – Managing Director – Saife Vet Med.